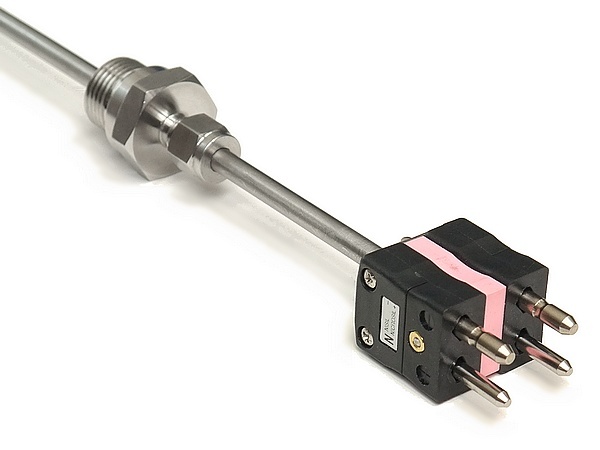 Industrial thermocouples are lower cost alternative to noble metal thermocouples, they are rugged and can be tailored to suit almost any industrial application whilst maintaining temperatures and accuracy up to 1250°C. Supplied in bespoke and standard lengths, they cover various temperature ranges and operational atmospheres with the option of permanent and adjustable immersion lengths within furnaces, ovens, kilns, galvanising baths, pipelines and any general heat treatment and temperature measuring atmospheres including reducing or oxidising, sulphurous and radiating. 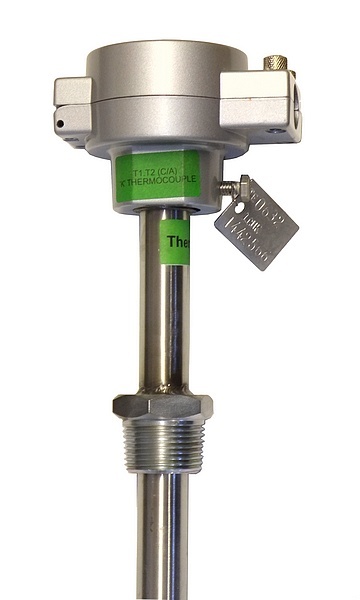 We stock a range of these industrial temperature sensors that can be ordered online, see the Industrial Thermocouples page of our Webshop for more details. Industrial thermocouples are available in a variety of sheath materials including mild steel, 304, 310 & 316 stainless steels, nickel chrome (253MA), Chrome Iron (446), Inconel 600 and protective coated sheaths. The thermocouples can be supplied in simplex, duplex or triplex configuration; each sheath is swaged and supplied in diameter range from 6mm to 32mm incorporating various wall thicknesses. The elements can be either insulated thermocouple wire ranging from 22 standard wire gauge up to 10 standard wire gauge or mineral insulated cable in diameters ranging from 1.5mm to 8mm. Each probe is fitted with a cast aluminium head IP65 rated weatherproof or standard flip top each type fitted with a ceramic terminal block with an option of a head transmitter. Other options include fitting an inner sheath, either metal or ceramic and each thermocouple can be supplied with an adjustable or permanently sited process entry fitting with metric, BSP or NPT fittings or a range of welded flanges. We can attach to each thermocouple head fitting extension or compensating cables with or without standard and miniature connectors. Listed below are some of our more popular types of this product, which may be available from stock or with a short lead time. Other options and models may also be available, please contact us for full details. 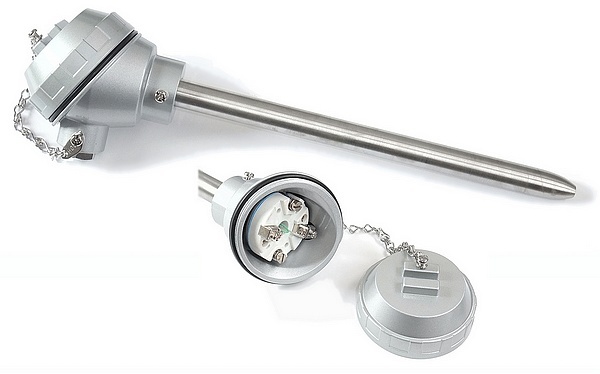 Mineral insulated thermocouples with compact IP67 weather-proof connecting head. Temperature Range: -100°C to +1100°C. 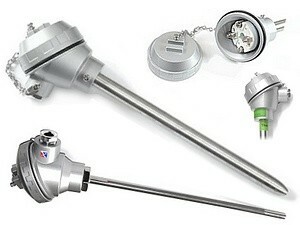 A 3mm diameter mineral insulated type K thermocouple, in a stainless steel outer sheath, with an IP68 weather-proof connecting head.